Hey, can you tell that I am deep into Will Murray’s history of the pulp western, Wordslingers? A history of a genre, an encyclopedia of mini-biographies of a thousand and one fictioneers, and a debate between the proponents of the action western with its randy crew of “gun-dummies” and more historical yarns. Yank those smoke-wagons, gun dummy! Excellent book. Grabbed my copy at the last PulpFest. And my pal and occasional Guest Blogger Brian Leno got around to reading another book mostly about the western pulps, Pulp Writer from 2007 (but still in print and on eBook), just in time to squeak something in for Biography Month. 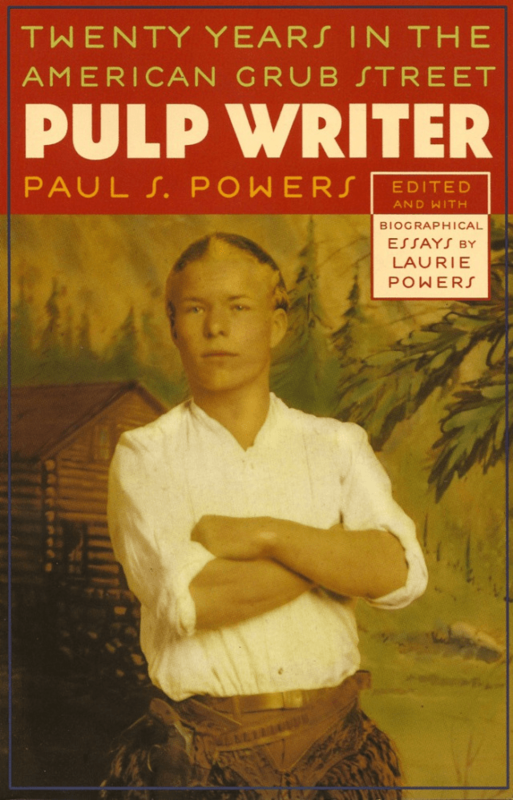 The story of how Laurie Powers found the bio of Paul Powers and began stepping into the pulp world — I believe she’s currently at work on a biography of Daisy Bacon, for many years the editor of Love Stories, one of the most successful wood pulp magazines of all time. You put your toe in, you sometimes find yourself jumping into the deep end of the pool. A couple of PulpFests back, I remember Laurie Powers and Will Murray holding down a dealers table, with Pulp Writer on display and Wordslingers still in the works. Robert E. Howard’s first published short story, “Spear and Fang,” appeared in the July 1925 issue of Weird Tales. That simple fact has made that issue a collector’s dream, propelling second-hand prices into the stratosphere, but there are more items of interest inside that usually battered old pulp. Author Paul S. Powers had a short story in this issue too, prosaically called “The Death Cure.” His second appearance in the periodical; “Monsters of the Pit,” his first, was considered good enough to capture the cover for the June 1925 issue. That byline may not be overly familiar to the purveyors of the weird and the fantastic, but under his pseudonym of Ward M. Stevens (and others) he brought action to thousands of readers who loved the pulps specializing in western fiction. But before Powers hit the sagebrush trail he appeared in Weird Tales and “The Death Cure,” a fairly simple yarn dealing with the murder of a drug addict and what happens when a maniacal doctor tries to bring him back to life, was actually Powers’ first sale to Farnsworth Wright. He was paid one-half cent a word, with the grand total coming to $21.75. This little item of pulp history I found in Pulp Writer: Twenty Years in the American Grub Street, an autobiography by Powers, edited by his granddaughter, Laurie Powers, who provides some very insightful essays to the volume. Ms. Powers, in her essay “Discovering Pulp Writer,” admits she knows very little about her author grandfather, and also confesses that she knows even less about pulp magazines. She writes that, before starting her research, the only pulp character she knew of was The Shadow. Her essay, dealing with the search and eventual discovery of her grandfather makes for great reading and provides good solid history pertaining to Paul S. Powers and Wild West Weekly and the author’s creations of Sonny Tabor and Kid Wolf. But the real gem in the book is Powers’ autobiographical portion, where he details his life in the pulp jungle, which he writes of with both pride and some bitterness. “Under my own name,” he states, “but usually under the several pen names I have used, more millions of words have been published than I care at the moment to tote up. I have been paid, by one company alone, in the neighborhood of one hundred thousand dollars.” Certainly something to be proud of — and many authors toiling today can probably only shake their heads in envy. The bitterness shows in Powers when he complains about the editorial policy of some pulps to only pay upon publication. This policy, of course, was something which would irritate many pulp authors, including Robert E. Howard. Pulp Writer had many laugh out loud moments for me, something I don’t usually do when I’m reading — but Powers’ short autobiography is a pure joy. There are many examples that would bear repeating but one of the most interesting concerns when he ran into a fellow writer who had almost gotten a story accepted by Esquire. Condescendingly, this almost accepted amateur informed Powers that the day could come when Powers might break into the slicks himself. Powers pens that he enjoyed telling this snob that he had already been published in the slicks, and that the really hard work came when he was trying to break into the pulps. I’m sure all lovers of those tattered old magazines will enjoy hearing of that exchange. The team up of granddaughter-grandfather is a good mix and provided me with a few hours of informative and entertaining reading. But what this book really did, and what every book should do, is make me want more. So don’t be surprised if you see me at Pulp conventions, picking up copies of Wild West Weekly. Or I might pound the eBay pavement and lasso a paperback of Powers’ novel, Doc Dillahay. Pulp Writer: Twenty Years in the American Grub Street will take the reader on a voyage to those golden times when entertainment could be had for less than twenty-five cents. As Laurie Powers discovered, it’s a journey well worth taking. This entry was posted in Lit, REH and tagged Daisy Bacon, E. Hoffmann Price, Esquire, Farnsworth Wright, H. Warner Munn, Henry S. Whitehead, Laurie Powers, Love Stories, Lovecraft, Paul S. Powers, PulpFest, Pulps, Seabury Quinn, The Shadow, Weird Tales, Wild West Weekly, Will Murray. Bookmark the permalink.